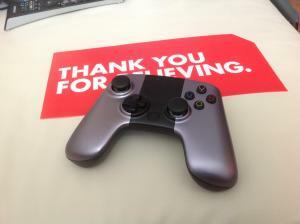 Received the OUYA yesterday. I am really not sure about this system. The build quality is allright, the joypad is good but the d-pad is very laggy. Controls in a lot of the games are quite laggy. Especially the emulators compared to other Android devices I have tested out and used. The system has a Tegra 3 chipset but when running Shadowgun on it it doesn't show the same fancy graphics as my Nexus 7 does, in fact it runs smooth and just as good and indistinguishably from the same game running on the GameMID, Archos Gamepad or JXD S73000B. The store is quite barren from big solid Android titles and the available titles have a 'nice' Indie feel to them. Still it is not the device of choice when you want to play stock Android titles. The emulators available through the store are great and the ones from Robert Broglia are amazing. Playing the games with the d-pad however introduces a kind of lag unfamiliar to the same emulators on the other current Android consoles like the GameMID, Archos Gamepad and JXD S7300B. Twin stick shooters like Expendable rearmed would run on it fine but aren't available in its store. For 99 dollars not a bad device but if you already have an android handheld like the ones mentioned above I'd not invest in the Ouya as there is little to none added value. I never saw any lag in anything but the quick ports (I must admit i didn't do any of the emulation). I haven't spent much time with mine so the few games i did try where mostly designed with Ouya in mind, i spent more with the dev kits. I don't do much arcade game playing or emulation nowadays so maybe Im not as sensitive to how it should feel. So far what you are saying is what most are.. I never felt the control was as bad as most ( sticky buttons etc.. ) but the lag, a few big games that where slapped into it show lag for sure, I still think its crappy quick ports (there are some horrible porting tools to hack touch screen to gamepad, laggy as heck, but free and easy to use, and I think to many are), but it don't matter, that's what is happening and how they play. I been a fairly big supporter.. but the negative of open platform is showing through.. nobody is doing any quality control.. its like the Wii shovelware.. throw it out and hope it sticks, damn if its any good or not.. far to much crap, or poorly ported crap it appears.. not good, you don't get a second chance in this game... All my positive hopes are going away quickly. I do feel its far better then the my last purchase that $89 gameyssytem thingy with the capcom/nintendo games with the PS2 like controllers.. I does XMBC excellent.. and has solved my PS3 whoa's with the cinemaweare copy protection, got ride of my xbox one for this tiny thing to stream my stuff like the good old days.. everything works now (streaming) again. But steaming .. can be done by tons of stuff..
lack of polish out the gate will doom it i think, no matter what i could do, this first impression is not good. To bad.. I was really looking forward to some of the cooler Android games with a real controller on something without a postage stamp screen.